The sharpening controls on the Detail tab adjust edge definition in the image. The Adjustment Brush tool and Graduated Filter tool use the Radius, Detail, and Masking values when local sharpening is applied. Use the Apply Sharpening To option in the Camera Raw preferences to specify whether sharpening is applied to all images or just to previews. To open preferences from within Camera Raw, click the Open Preferences Dialog button in the toolbar. Zoom the preview image to at least 100%. Adjusts edge definition. Increase the Amount value to increase sharpening. A value of zero (0) turns off sharpening. In general, set Amount to a lower value for cleaner images. The adjustment is a variation of Unsharp Mask, which locates pixels that differ from surrounding pixels based on the threshold you specify and increases the pixels’ contrast by the amount you specify. When opening a camera raw image file, the Camera Raw plug-in calculates the threshold to use based on camera model, ISO, and exposure compensation. Adjusts the size of the details that sharpening is applied to. Photos with fine details generally need a lower setting. Photos with larger details can use a larger radius. Using too large a radius generally results in unnatural-looking results. Adjusts how much high-frequency information is sharpened in the image and how much the sharpening process emphasizes edges. Lower settings primarily sharpen edges to remove blurring. Higher values are useful for making the textures in the image more pronounced. Controls an edge mask. With a setting of zero (0), everything in the image receives the same amount of sharpening. With a setting of 100, sharpening is mostly restricted to those areas near the strongest edges. Press Alt (Windows) or Option (Mac OS) while dragging this slider to see the areas to be sharpened (white) versus the areas masked out (black). (Optional) To apply the newest sharpening algorithms to images, click the Update To Current Process (2012) button in the lower-right corner of the image preview. The Noise Reduction section of the Detail tab has controls for reducing image noise, the extraneous visible artifacts that degrade image quality. Image noise includes luminance (grayscale) noise, which makes an image look grainy, and chroma (color) noise, which is visible as colored artifacts in the image. Photos taken with high ISO speeds or less-sophisticated digital cameras can have noticeable noise. When making noise reduction adjustments, first zoom in on the preview image to at least 100% to see the noise reduction previewed. 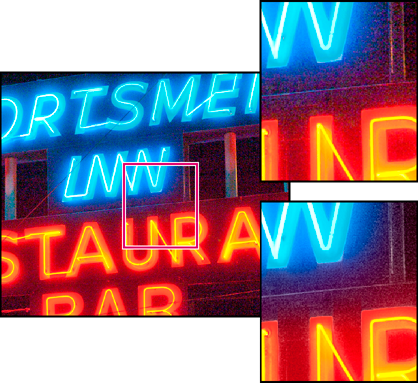 Adjusting the Color and Color Detail sliders reduces chroma noise while preserving color detail (lower right). If the Luminance Detail, Luminance Contrast, and Color Detail sliders are dimmed, click the Update To Current Process (2012) button in the lower-right corner of the image. Controls the luminance noise threshold. Useful for noisy photos. Higher values preserve more detail but can produce noisier results. Lower values produce cleaner results but also remove some detail. Controls the luminance contrast. Useful for noisy photos. Higher values preserve contrast but can produce noisy blotches or mottling. Lower values produce smoother results but can also have less contrast. Controls the color noise threshold. Higher values protect thin, detailed color edges but can result in color specking. Lower values remove color speckles but can result in color bleeding.